My mom just had knee surgery so of course she got a choice of treats. Without hesitation, she said flan. 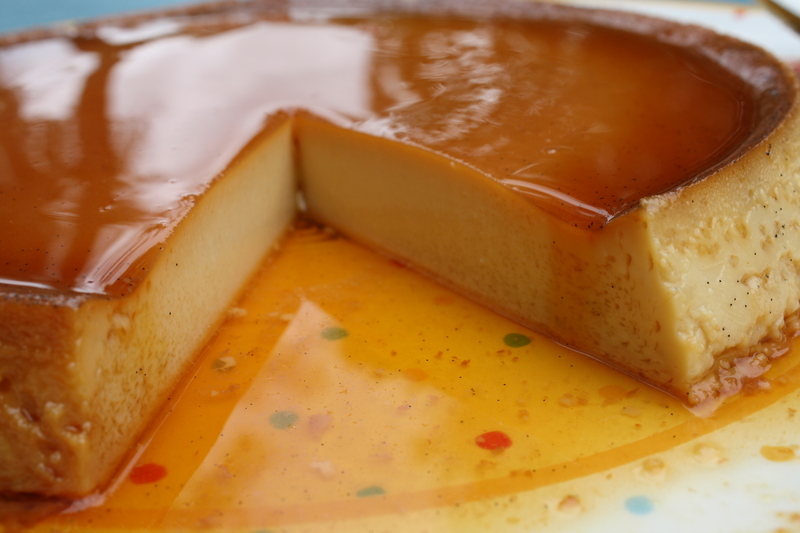 Flan is an egg-milk custard and versions of it are made all over the world: Latin America, South America, Portugal, Spain, Brazil, Philippines, Vietnam, and Japan. 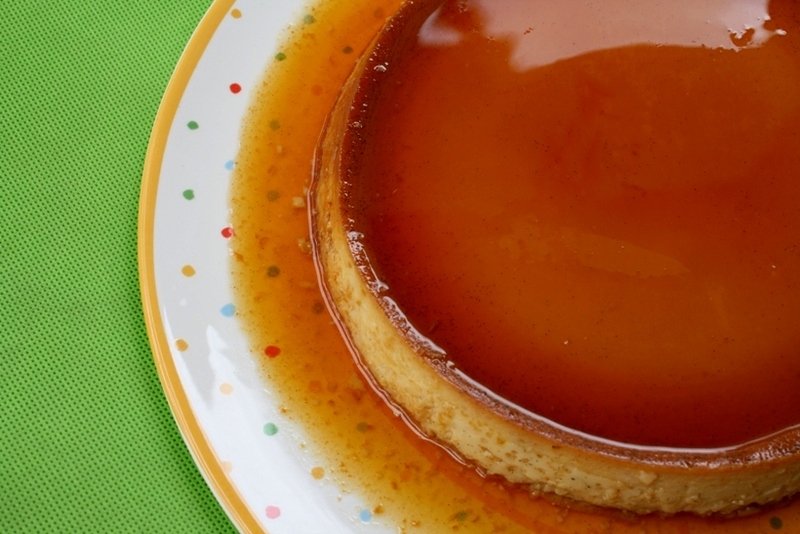 It goes by many a name: flan, leche flan, flan de huevo, crème caramel, crema Catalana, bánh flan, bánh caramel, and purin. Some say the best part is the custard and other argue it’s the caramel that is cooked on the bottom of the flan and drips lusciously over it once the flan is served. I simply can’t choose. I like flan. I really like sampling flan all over because it can be so personalized to the culture, the neighborhood, and right down to the family. I’ve had it in many homes and restaurants and it’s always slightly different. 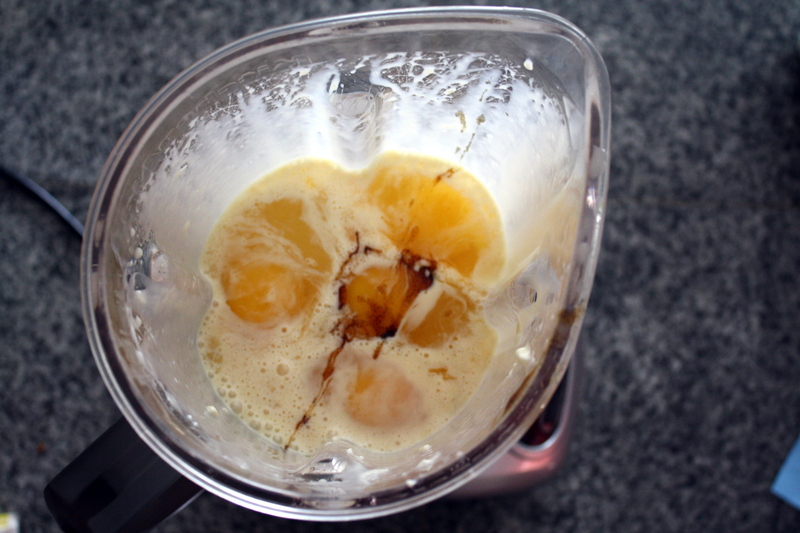 I am not particularly fond of recipes with a ton of egg in it, making egg the predominant flavor in the flan. My favorites tend to be smooth rather than jiggly and do not taste of eggs, but instead of rich, balanced custard. 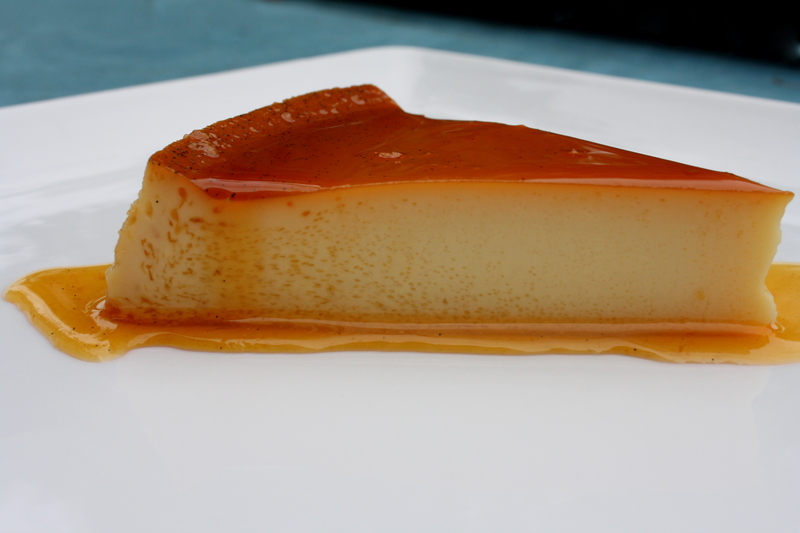 I like to focus on the texture of the flan, letting it melt away between my tongue and the roof of my mouth. The little bit of cream cheese in my version gives it a great mouth feel – creamy and silky. If you want an extra creamy flan, use a whole package of cream cheese (8oz). I’ve used a range of amount of cream cheese (from 3 oz up to 8 oz) depending on what I have in my fridge when I make it and who I’m making it for. 3 oz make it more like a traditional flan, 8 oz makes it rich like cheesecake. This recipe is one I know by heart because it’s so easy. There are two tricky parts: getting the caramel right and waiting to eat it. Don’t let the caramel scare you – just make sure you watch it and don’t stir it. Note: you’ll need a 9” or 10” round pan and one larger in diameter for a water bath for the flan to sit in while it cooks. Test out how much water you need beforehand; you need enough to go halfway up the side of the flan pan when it’s inserted. * I order my vanilla bean paste (and many other spices) from The Spice House in Chicago. They’re fast and the customer service is great – I’ve gotten a handwritten note in my order before! Preheat oven to 350 degrees. In a small sauce pan, add in sugar and water. Stir with the top of a wooden spoon to combine. Cook over medium heat, swirling every few minutes, until the syrup begins to bubble. Turn the heat down to medium low and let it cook until the caramel is a deep golden brown. Do not stir the syrup/caramel after you turn the heat down. It’ll take about 20 minutes for the caramel to reach the right color; it’s best not to go too far from the stove while it’s cooking. 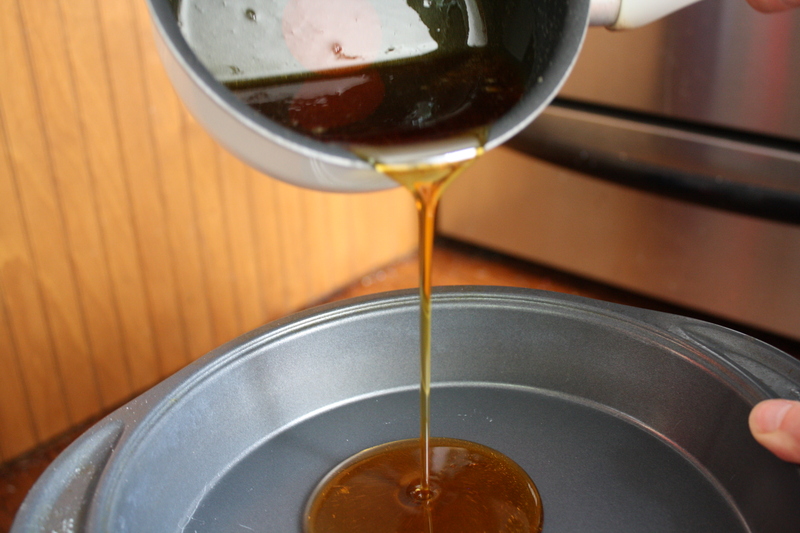 Pour the caramel into the pan you’re using to cook your flan, swirling the pan to coat with the caramel. Also, be sure to take the caramel off the heat just before you think it’s the right color. It will continue to cook and darken until you pour it into the pan. 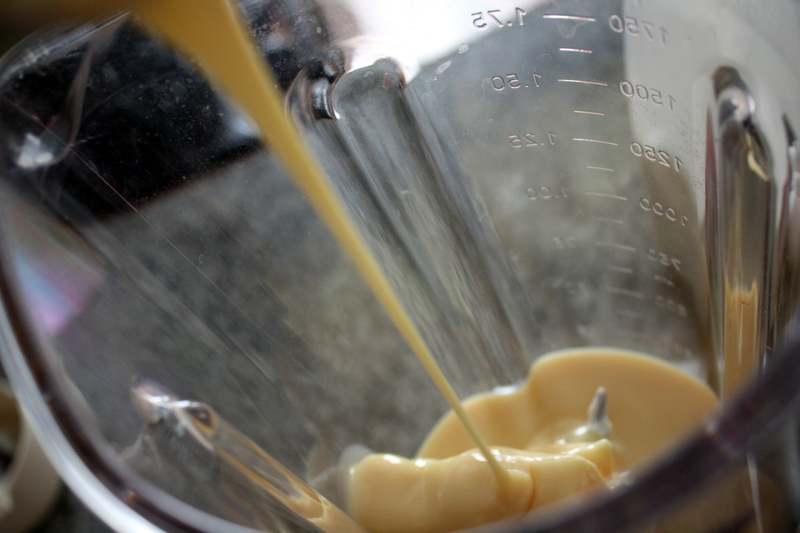 While the caramel is cooking, start making the custard. 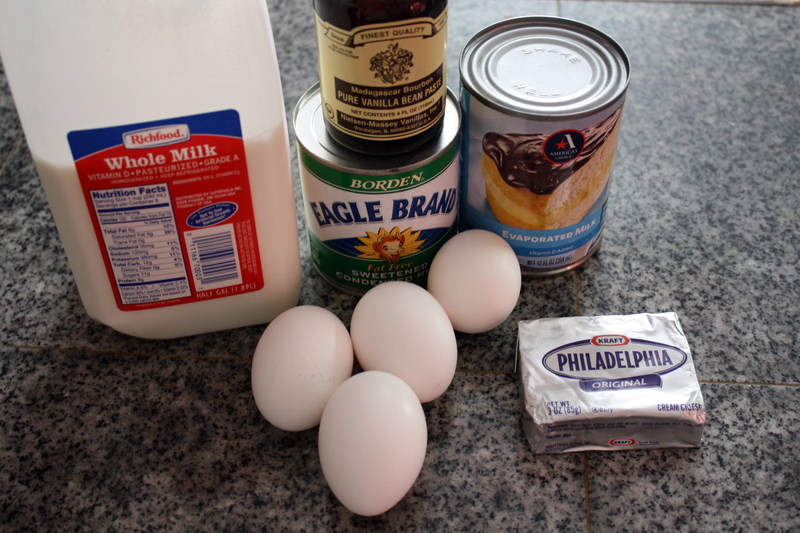 In a blender, add the cream cheese and sweetened condensed milk. Blend together until smooth. Add in the rest of the ingredients and blend well. Set aside until the caramel is done. 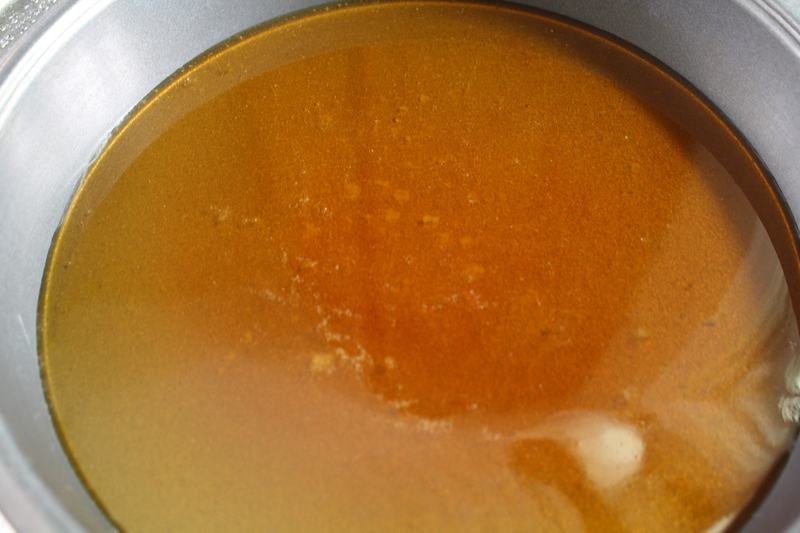 When the caramel is finished cooking and cooled slightly in the pan, pour the custard on top. Put the larger pan in the oven and then fill it with very hot water to the pre-determined height. Carefully place the flan in the larger pan. Bake for 75 – 85 minutes. Begin checking the flan at 75 minutes: reach into the oven and gently move the pan back and forth. The center of the flan should still jiggle slightly, but the edges of the flan should be set when it’s done. If the center of the flan doesn’t jiggle at all, it’s over-cooked and won’t be as creamy. It will be edible, just not lick-your-plate-perfect. So check it every 5 minutes or so after the 75 minute mark. The flan will fully set up in the fridge later to a perfect creamy consistency. 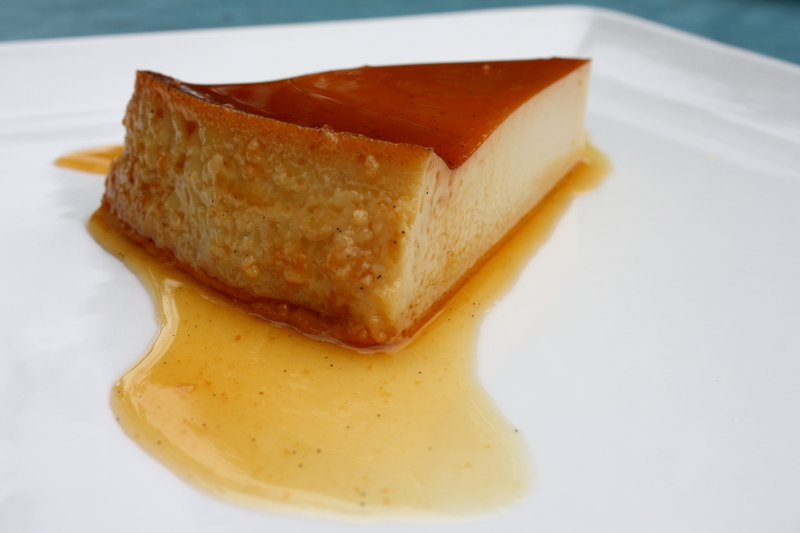 When the flan is finished, carefully remove it from the oven and let it cool to room temperature, about 2 hours. Refrigerate it for at least 4 hours and up to overnight. When ready to serve, take the flan out of the fridge for about 20 minutes and run a knife around the edge of the pan. Place a plate larger than the pan on top to the flan and quickly invert the pan and plate together. The flan won’t release immediately but should soon after flipping it. If the flan doesn’t immediately release, try one of my two tricks. 1) Put an inch of really hot water in a pan (larger than the flan pan) and let the flan sit in it for 5 minutes to warm up the caramel on the bottom. Or 2) Heat a frying pan on the stove until it’s hot. Place the frying pan on top of the inverted flan. This should warm up the caramel layer and help release the flan. Once you hear it release, let it sit for about 5 minutes so the excess caramel can drip down and cover the flan. After those agonizing 5 minutes are up, pull the pan off and reveal your glorious flan. 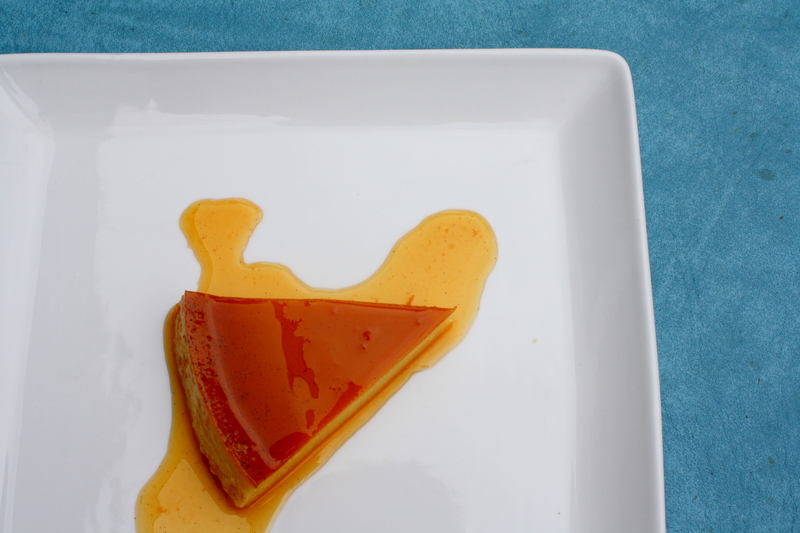 The easiest way to cut flan is with unflavored dental floss. It cuts through the custard easily and neatly. No floss? Use a knife without a serrated edge. Or you can just dig in with a bunch of spoons. It’s great plain or with some fresh fruit. Enjoy! This entry was posted in custard, dessert, Latin American, Mexican and tagged caramel, creamy, custard, eggs, flan, sweetened condensed milk, vanilla bean, vanilla bean paste. Bookmark the permalink. Wish you and Tommy lived closer to us!!!!!!!!!!! We would love to try ALL your foods. I didn’t know your mom had knee surgery. I hope she is doing well. KEEP COOKING!!!!!! !